The origins of arabic numerals might seem unbelievable to many. The Anglo-Saxons or the Romans certainly didn’t invent it to go with ‘English’. But the strange narrative nature of these drawings seem to tell a tale other than the history of numbers; it seems to be typographers’ ‘type play’, re-writing phrases with numbers. 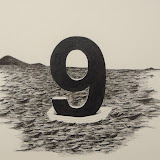 For example, would ‘cloud number 9’ mean the same as ‘boat 9 at sea’? The recent drawings by Ang Soo Koon differ slightly in thought and presentation from her work in Found & Lost. The exercise into numbers may seem minimal, and playful, almost like storyboards for Sesame Street episode, playing out a number game for kids. But there aren’t 9 boats with the letter 9, so things aren’t quite what they seem. Examining the quality of line of each individual drawing, they are acutely loose in composition, generous in space for the imagination to roam. The feel of the work resonates with the kind of sensibility of Sandra Lee’s Fables series,unfolding mise en scène, like child’s play. In a simplistic interpretation, the drawings are like snapshot portraits of numbers in their various travels. In a complex manner, it associates the signifier (physical scribble of a number) to the sign (the concept of a numeral), and narratives not bound by the sign, but by an imaginative narrative. As simplistic as it might sound, if we pare down the world with mathematics, it is made up of numbers. The web page you are reading is ultimately a digital signal consists of ‘1’ and ‘0’. Anyone who has watched Π (1998), directed by Darren Aronofsky, or queues to buy 4D would agree that our lives are surrounded by divine numbers. But in a life not governed by numerology, there might be things prettier, more intriguing than numbers, no matter what dress they wear. Vincent Leow’s installation “Red Numbers” (1999) at the Turf Club.